First time in trade paperback: the fourth novel in the #1 New York Times bestselling series. Vampire hunter and zombie animator Anita Blake is an expert at sniffing out the bad from the good. But in The Lunatic Cafe-now in trade paperback for the first time-she's about to learn that nothing is ever as it seems, especially in matters of the not-so-human heart. Dating a werewolf with self-esteem issues is stressing Anita out. Especially when something-or someone-starts taking out the city's shapeshifters. Even though I guessed the villian as soon as we met, I still enjoyed reading the betrayl and other twists. Edward is great as always. The relatioships between Anita's men keeps growing, but it would be nice to see her throw in someone normal, just for perspective. 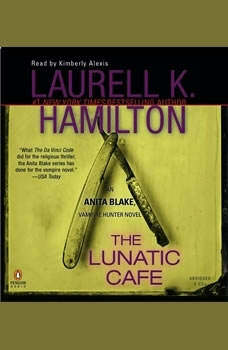 The lunatic caf� by laurell k hamilton is one of the earlier ones in the anita blake series. I have been reading them all out of order, and am quite advanced in the series, so a flashback to this earlier book is a little weird. I can see how much Anita, and even her friends, have progressed as people, and in their powers. I certainly like Anita as a person a lot more in the later books than the earlier books such as this one. Here, anita is still just a necromancer and vampire slayer, working that weird little firm for her boss, and occasionally consulting with the police. She has just started to date Richard, a goody two shoes werewolf who annoys me to no end. Anita, and her best friend Ronnie are pretty goody goody themselves at this point, but at least they have potential. It's a pretty interesting story, but not one of the best in the series, and if you skipped it, you wouldn't be missing anything at all. But, as long as you like the anita books, you might as well read it and be entertained. And if you've only read up to this point in the series, keep reading. It just gets better. While I don't consider these books to be literary genius by any means, I find myself strangely addicted to this series. I am constantly annoyed at the heroine's abrasiveness and complete lack of tact and yet, can't wait to find out what she's going to do next. Plus, the whole sexual tension between her and the master vampire, Jean Claude is enough to drive me mad with anticipation!